New Center Consulting is an accredited Better Business Bureau Business. 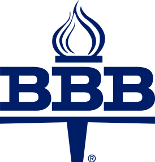 The BBB is a non profit organization that Ranks and Rates businesses for trustworthiness and history of resolving complaints. You can check out any company on their website and see if they are accredited or not and get their current rating. Before you buy from our competition, check out their rating and see if they measure up to the level of New Center Consulting, Inc.